To conclude, each chapter in Power Tools has a trigram (Tao te Ching) associated with two objects (I Ching diagram). = hence the secret codex. Will be sure to cover more to this with Workbook 2 and 3, due in print this year (2014). Dr.RAM in Depth #2 : "After Mexico... we talk DAATH"
Why did you leave your dream job in the Military? and he had a meeting with some high officials. Just before this discussion, we spoke about Mexico. 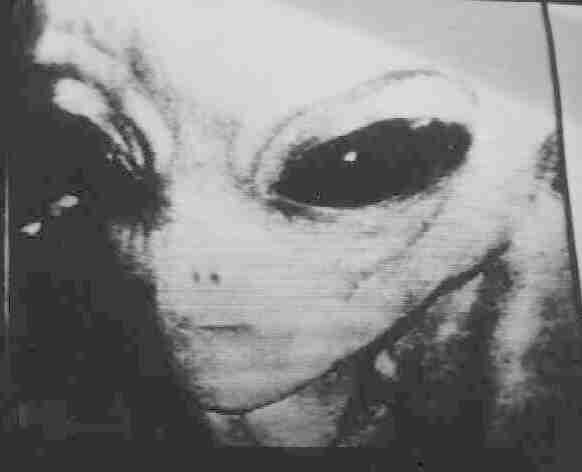 Q: "Have we humans been invaded by Aliens?" That early discussion was quite magical in parts. What happened, after the (Skype call) collapse? Convinced high end people that "it would be cool to feed people"
"I did not go to college to make weapons... I invented mazer and tazers"
Will it happen very fast? Yes. Saturday? It can start then, but there will be layers and layers. Who is funding the geo-engineering ? "They are no longer advancing humanity. They want control." A US State seceeds from the Union. Everyone on bicycles. Everyone in HK works, or they lose face. And we need to teach our children. "Everyone is going to wake up and talk to God." That also means listening to God - we can listen to ourselves. re: Uri Geller, and his "discoverer": Andrija Puharich. Da'at or Daas ("Knowledge", Hebrew: דעת [ˈdaʕaθ]) is a Hebrew word that means belief. 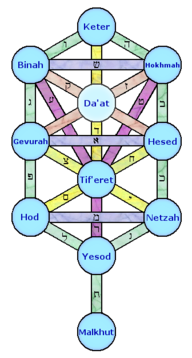 In the branch of Jewish mysticism known as Kabbalah, Da'at is the location (the mystical state) where all ten sephirot in the Tree of Life are united as one. In Da'at, all sephirot exist in their perfected state of infinite sharing. The three sephirot of the left column that would receive and conceal the Divine Light, instead share and reveal it. Since all sephirot radiate infinite self-giving Divine Light, it is no longer possible to distinguish one sephira from another, thus they are one. Da'at is not always depicted in representations of the sefirot, and could in a sense be considered an "empty slot" into which the gem of any other sefirot can be placed. Properly, the Divine Light is always shining, but not all humans can see it. The concealment or revelation of the Divine Light shining through Da'at does not actually happen in Da'at itself. It only seems that way from the human perspective within Malkuth. The perception of change can only occur in Malkuth. Humans who become self-giving like the Light become able to see it, and for them the benefits of Da'at's light seem "revealed". However, humans who remain selfish cannot see it, and for them its benefits seem "hidden". Dr Richard Alan Miller, a top physicist, is known for his fresh point of view. Miller shares some thoughts after his return from Mexico, and talks about how the Internet may be conscious - and what it would mean if aliens invaded us by occupying a share of our minds. At "10 past Four in the morning" - in Icke's time zone. JR: "They have pulled the trigger on humanity... very quickly." DI: "By the time we experience it, it's a done deal." "They record their information in the wave-form... and it manifests"
Twitter and Facebook is MOLDING how people think." People have very short attention spans: lose focus after 3 pages reading. DI: "Internet is a two-edged sword... has become a collective mind." ESP Induction Through Self-Hypnosis - Best selling author, lecturer & research specialist Dr. Richard Alan Miller reveals a wealth and depth of knowledge and experience in three major fields; Alternative Agriculture, New Age Physics, and Metaphysics. Before many leading edge concepts became trendy topics, Miller was (and is) on the international front lines of research, experimentation and documentation. ( Subscribers to the G.FoX-channel are growing nicely - now 52 people. Metaphysical subjects, environmental, and all points in between.with John B Wells on Caravan To Midnight. Dr. Richard Alan Miller is a pioneer in the annals of metaphysical and paranormal exploration. Miller began working in the "X-Files" world of Navy Intel (Seal Corp. and then MRU) in the late 60s. His public collaborations and research continue. I caught up with Dr Miller briefly this morning, and will be interviewing him again soon. who had a "feminine presence", and could communicate telepathically. Dr Miller's memories are limited because of screen memories, etc. Got it ! This one is a cracker ! 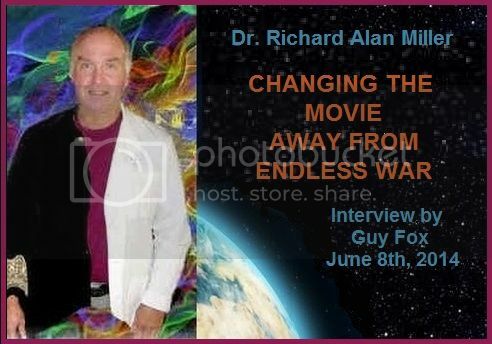 Welcome back to GuyFox Channel, and our ongoing conversations with Dr Richard Alan Miller. This talk one took place on June 8th, and was a voyage into some dark places about the possible future of humankind. But it is not without hope, and ideas of how to avoid the worst that may be coming our way. Near the beginning of the conversation, Dr Miller refers to a presentation done for NASA and some alphabet agencies. I was initially reluctant to go down this path, since it had seemed very dark, and I was unprepared. By the end, I was glad I had done so. Dr Miller, as usual provided a fresh perspective that allows us to see a different path. We can break the pattern of endless war, and constant fear, by finding the courage to look inside ourselves for new questions, new answers and all-important positive intentions. We need to seek a greater appreciation of the importance of Water, the Elixir of Life that swims inside us, and without whose magical properties we would not be God's chosen creatures... of precious imagination, and positive emotion. Some Americans (not a huge number, probably under 50-100,000) may die within the next 5-10 years, from uncertain causes. 06-08-14 – Survive the Blackout – 10 day interactive scenario. "War is good for ... nothing... except business"
MH: Stop. I don't think so- America's been the subject of a takeover. MH: I agree... That's why I do the show! We help inform the public! RAM: It's going to get better... Walmart is failing. No one has money to spend... No one has new clothes. RAM: Our concept of spending to prosperity was crazy! We bought too many things we don't need; lost sight of what matters. MH: Who would want to destroy the culture? And why? The competition for fuel resources worldwide deepens as the economic crisis looms. Are we willing to go to World War III over the fight for oil resources? Reverse Engineered Alien Technology could solve the crisis if we could extract it from deep inside the industrial military complex's secrecy over the issue. : Alien interventions right now. "The Bush family had a bad week. dealing in illegal weapons (over 350 weapons!) through the Israelis. This includes the Nuke that did 9/11. The info is out there now, to (indict or hang) them all." MH: "Expect the Fed to call an emergency meeting in the next 30 days. The Sh-t is hitting the Fan right now !" A pioneer in the annals of metaphysical and paranormal exploration, Dr. Richard Alan Miller will discuss engineered water, alternative agriculture, geo-engineering and how it all relates to future warfare technology. First Half: Author and preparedness expert Mat Stein will discuss his own worst case scenario—the recent death of his wife from cancer and her refusal to try alternative treatment until it was too late, and how the experience has been a profound spiritual journey. 2nd Half: Author, publisher, and former CNN science features news producer, Marshall Masters will provide an update on new evidence pouring in for an object on the other side of the sun, which could be Planet X. Episode 15 - What Does The Man That The X-Files Was Based On See Coming In The Future? What’s happening on a political and financial level in the U.S. and around the world is hardly a new phenomenon. In fact for centuries there has existed a rather clear pattern that once the governments start spending wildly outside of their means, they then begin to clamp down and try other methods of shaking down their constituents and coming up with more money, power, and control. But what if you could become your own government and internal sovereign state and leave all of it behind? On today’s Radio Arcadia podcast we had special guest Dr. Richard Allen Miller, who let’s just say has seen a thing or two that the average person doesn’t ever get access to. Dr. Miller is a quantum physicist, and basically an all-around genius as well as one of the smartest people I’ve ever met, and in addition to being called on by the Navy to train the Seals to become super soldiers who tap into some paranormal decision making skills in order to keep themselves alive, he’s also one of the main figures that the show the X-Files was based on. So in today’s interview we took a break from looking at some of the financial and Wall Street related issues to discuss some of the social and sovereign aspects of being prepared for life after the dollar and whatever changes that might bring. In particular Dr. Miller talked a lot about the importance of having a good and reliable water source, as while there are a lot of things you can survive without, water just isn’t one of them. However like just about anything else that we’ve studied or tried to figure out in life, once you start thinking about what changes are coming and how you might want to respond, the solutions begin to appear. Fortunately you don’t have to solve everything overnight, and even if it doesn’t always seem like it, you’re probably a lot further along than you might even realize. Dr. Miller also discussed some of the ways in which we can also prepare ourselves for anything that comes our way, as believe it or not, a lot of the methods he used to train the Navy Seals are based on meditation and breathing techniques that many around the world have been studying and implementing. Given that he also is familiar with and has seen inside of some of the government mind control programs, it was simply stunning to get inside his body of knowledge and hear how he responds to all of the nefarious government programs that have been making live more difficult for citizens around the globe. duncan rhodes - news channel ? Dr.Rick called the next one: "One of the Best interviews that I have (ever) done"
"One of the BEST EVER" ! - Jimmy calls it Wow ! Dr. Richard Alan Miller, our guest was the inspiration for Fox Mulder of the X-Files and was the original consultant on the set for Chris Carter. This is truly one of the best conversations ever on FADE to BLACK and Richard and Jimmy cover everything from ET to an event that may happen in 2050. DrRAM was interviewed by Solaris Blueraven last night (SAT).